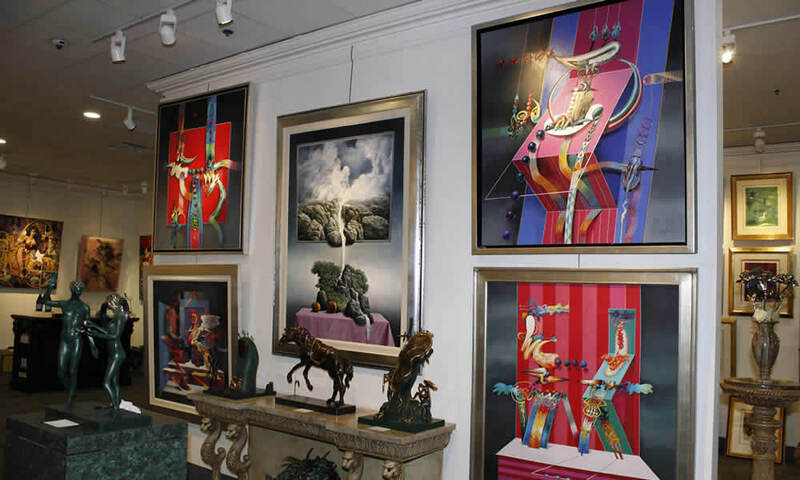 "Centaur Art Gallery - Repeatedly Voted #1 Art Gallery in Las Vegas, Nevada"
Welcome to Centaur Art Gallery, the oldest Las Vegas gallery featuring the works of master artists. When you enter the gallery you'll notice a collection second to none. Whether you're looking for a contemporary master, such as Leroy Neiman, or a piece of antiquity from Rembrandt, you will be amazed at what you will find. Landscape painter, particularly of architectural subjects and mountains, and etcher. Born 28 June 1865 in Glasgow. Destined for a commercial career, he began studying at evening classes at the Glasgow School of Art c. 1881, and in 1885 entered the Royal Institution, Edinburgh, as a full-time student. Encouraged to etch by the amateur artist George Stevenson, and in 1889 elected A.R.E. (resigned 1902). Had already started painting and exhibited two oils at the R.S.A. 1886. A member of the Glasgow School, he became an A.R.S.A. and A.R.W.S. in 1904, R.W.S. 1906, A.R.A. (engraver) 1911 and A.R.A. (painter) 1916, R.S.A. 1918 and R.A. 1920. Knighted 1924 and appointed King’s Painter and Limner in Scotland 1933. Commissioned by the Canadian Government to paint war pictures in France 1917–18. Illustrated Sir Herbert Maxwell’s Story of the Tweed 1905, made etchings for an edition of The Compleat Angler 1902, and for R. B. Cunninghame-Graham’s District of Menteith 1930. Trustee of the Scottish National Galleries, and of the Tate Gallery 1921–7. He died in Perth 16 September 1945. © 2019 Centaur Art Gallery.